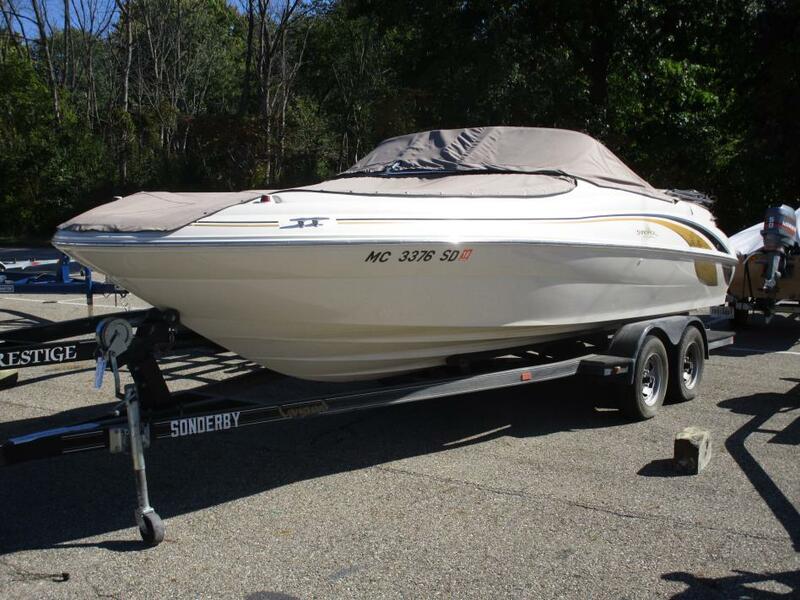 2000 Sea Ray 210 Sundeck 21 Ft. Bowrider w/ Aluminum 2 axel trailer, 5.0 Liter EFI, New outdrive last year, Runs great, Clean exterior, Clean interior (rear seating freshly reupholstered), Swim platform, Fresh water tank and toilet with waste tank (never used by me), cushions to convert front to sunning platform, front and rear round tables, Brand new Bimini, Cockpit and Front canvas. Must Sell! 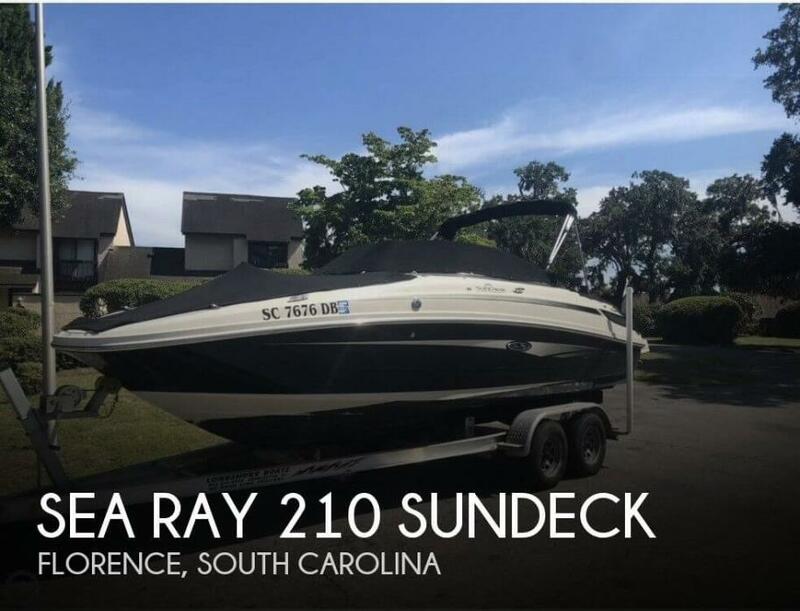 2001 Sea Ray 210 Sundeck Very good condition 21 foot Sea Ray (fun deck 210). V8 power, self contained enclosed head, two dining tables, stereo, stabalizer, snap in carpet, vinyl in perfect condition. 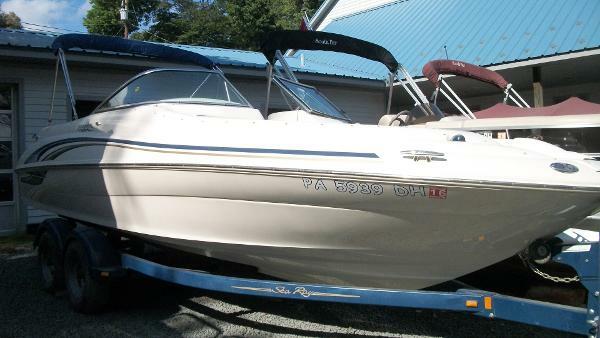 2000 Sea Ray 210 Sundeck 2000' Searay Sundeck 210 for sale. I have had this boat for 6 years. the motor was replaced four years ago. The outdrive is a year old with two years left on the warranty. The interior was reupholstered two years ago. Boat is in great mechanical condition and looks great. I live on a freshwater lake so it has only been used in fresh water since I have owned the boat. 1999 Sea Ray 210 Sundeck This Sundeck has had a complete makeover from bow to stern. The engine was rebuilt with only 10hrs on it, new interior, new paint, and new bimini top. 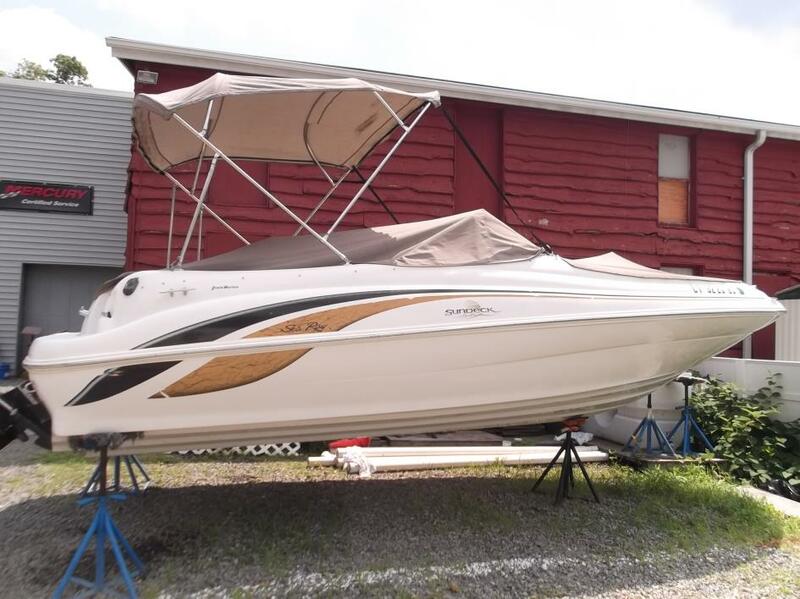 Mercruiser 5.0L EFI 240HP, Garmin 441s GPS, Transom Shower, Forward & Aft Boarding Ladders, Tables Forward & Aft, Porta Potti, Compass, and Stereo. The seller has receipts for all of the work performed. Trailer available. 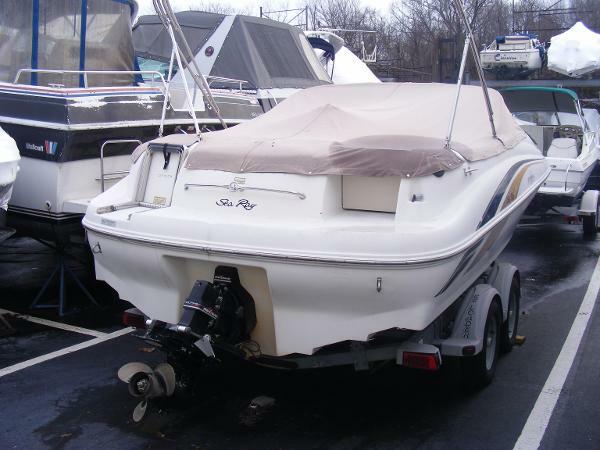 1999 Sea Ray 210 Sundeck This is a dry Stored 210 Sundeck.. 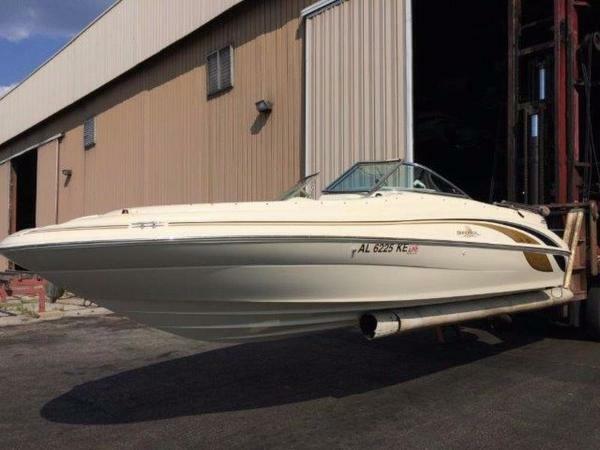 It has 300 hours on a Mercruiser 5.0l Alpha. It is equipped with a Marine Head; Bimini Top , Cockpit Carpet; CD Player; Cockpit & Bow Covers; Extended Swim Platform; Depth Finder & Compass TRAILER NOT INCLUDED. 2008 Sea Ray 210 Sundeck The 210 Sundecks wraparound windshield is just like the one youll find on Sea Rays larger Sundecks, constructed of tempered and tinted glass. Theres a fiberglass bow block-off door below this windshield to limit air flow into the cockpit while the vessel is underway. This is another feature you wont find on too many deck boats this size. 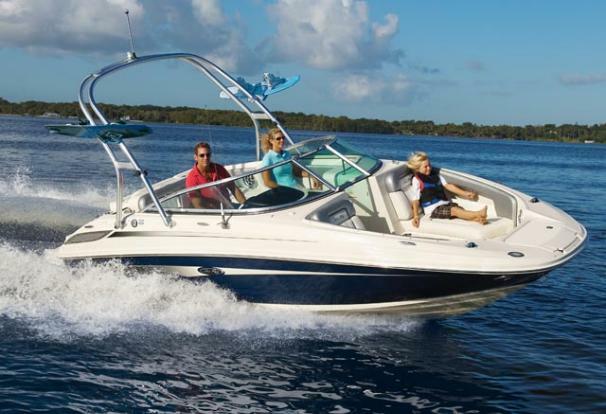 For those who crave the wind-in-their-hair freedom that bow riders provide, the 210 Sundeck offers a pair of lounges up front with integral armrests and cup holders. These bow seats are deep and perfectly shaped for safe, comfortable reclining. Theyre also hinged to provide access to big port and starboard storage compartments. At the nose, an optional telescopic ladder can be added for no-hassle boarding from the shore. Twin bucket seats welcome the driver and companion; both seats swivel and slide and have flip-up, thigh-rise bolsters. A lockable fiberglass head compartment in the port console means less dockside restroom stops, therefore, more time for family fun. The helm console and its soft-touch, keyless dash could be straight out of a luxurious sports car. The same could be said for the chrome-bezel gauges and lighted switches. In addition, steering is power-assisted, with a tilt wheel and integrated Vessel Control System (VCS) thumb pads that control the standard SmartCraft functions and the Clarion stereo with CD player, four speakers and MP3 port. A smooth-gliding throttle and shift with built-in trim connects to the standard 5.0L MerCruiser MPI Bravo III MCM (260 hp - 194 kW) gas sterndrive, which comes ready to rock n roll with a stainless-steel propeller and remote oil filter. Based on a 21-degree-deadrise hull, the 210 has no trouble flying across the waves and cutting sharp, strong turns. Optional power offers a fuel-injected 350 Magnum MPI Alpha I MCM (300 hp - 224 kW). Located to starboard, behind the helm seat, an entertainment center serves the passengers, who can keep drinks frosty in a carry-on cooler with dedicated storage. An L-shaped bench provides plenty of room for guests to stretch out, while an in-floor storage compartment offers a secure space for gear and water toys. This hatch locks and has vinyl matting inside to protect all the goods. An acrylic door leads to the swim platform, where another big-boat item awaits in the form of an aft-facing bench. Sit back and watch the kids swim, or just bask in the scenery. The port section of the bench hinges up to give access to a huge padded storage compartment for skis and wakeboards. 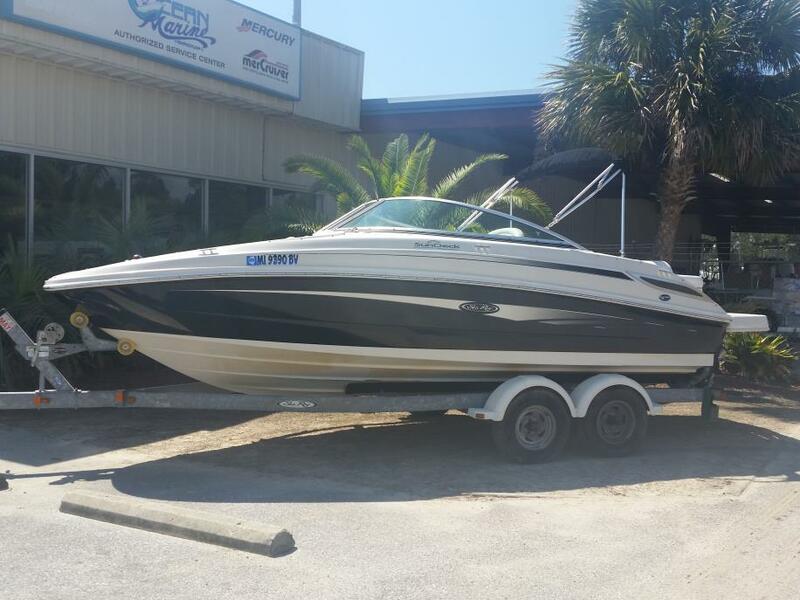 1999 Sea Ray 210 Sundeck, MerCruiser 5.0 EFI Bravo III 240HP with 450 hours. Depth sounder, Horn, Stereo, Compass. Swim platform, Bimini top, Cockpit cover, Bow cover. Head system. Cockpit table, Cockpit camper, Ext platform, Tilt wheel. 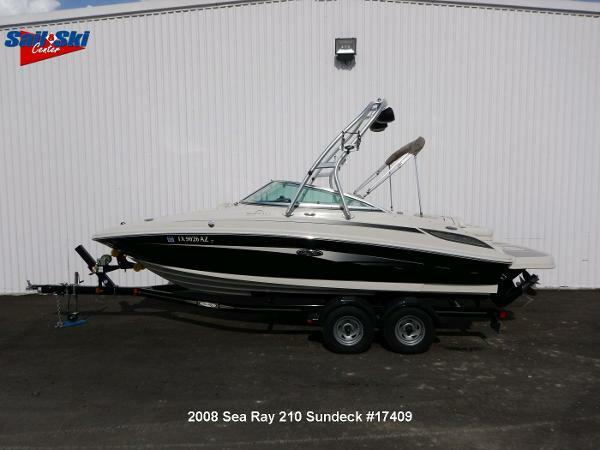 2008 Sea Ray 210 Sundeck If you have been searching a super clean, high quality, pre-owned boat that is aggressively priced then check out this 2008 Sea Ray 210 Sundeck. In addition to being stored indoors, this freshwater beauty has been dealer maintained with an open check book since new, and it shows. The Mercruiser 5.0L MPI 260HP engine with Bravo 3 drive - only 166 hours - has been fully serviced and is ready to enjoy today. 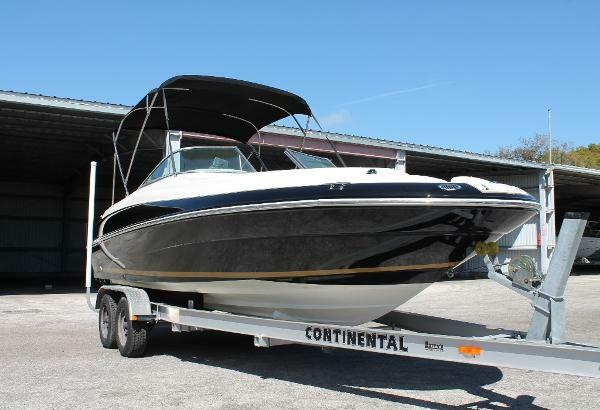 This heavily optioned 210 Sundeck includes the following features and options: 5.0L MPI 260HP MPI V-8 with Bravo 3, two-tone gelcoat, cockpit and tonneau covers, wakeboard tower, bow table, bow filler cushions, Sirius satellite radio, battery on/off switch, tower speakers, docking lights, fire suppression system, bow swim ladder, wakeboard racks, bimini top and pump out head system. The Shorelander tandem axle painted trailer has new tires and is included in the package price. 2001 Sea Ray 210 Sundeck The Sea Ray 210 Sundeck with Merc. 5.0L engine. 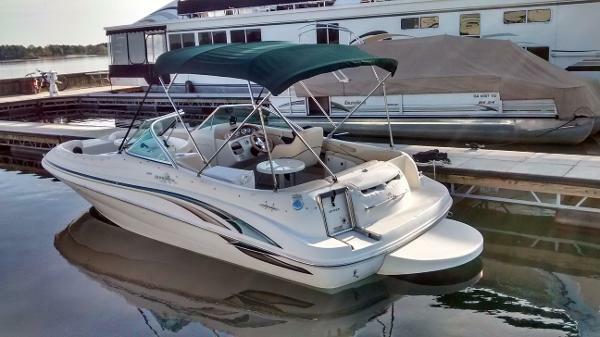 Options include: Snap out Carpets, in-floor storage, full head, bow filler cushions, SS prop. 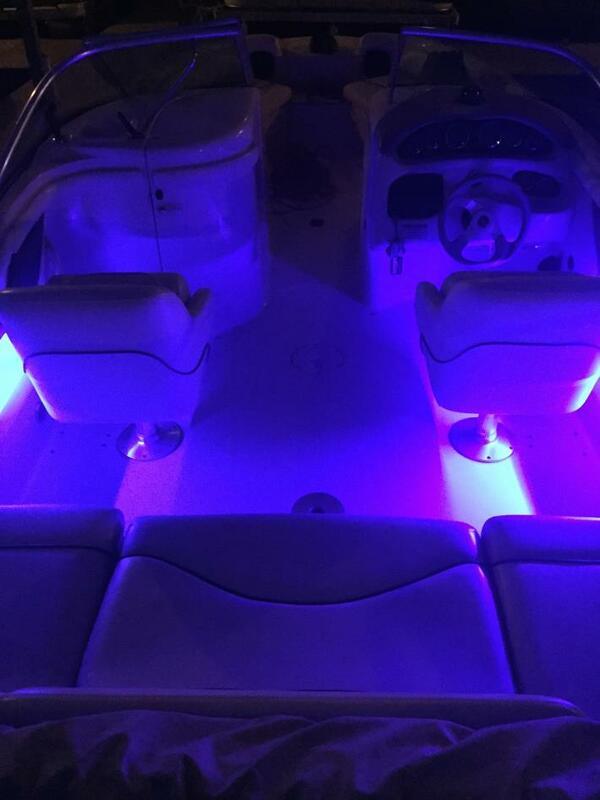 Boat is in fantastic condition. Includes Trailer. 243 Hours. 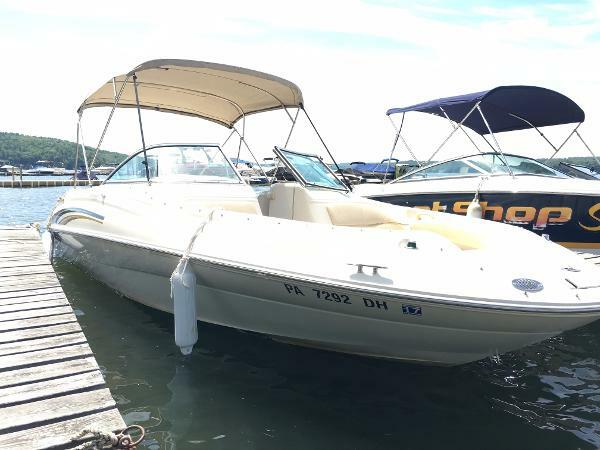 1999 Sea Ray 210 Sundeck 1999 Sea Ray 210 Sundeck This is a One Owner Dry Stored 210 Sundeck that we sold new. It has only 210 hours on a Mercruiser 5.0l Alpha with Stainless Steel Prop. It is equipped with 2 Cockpit Tables; Pump Out Head; Bimini Top with Boot; Cockpit Carpet; CD Player; Cockpit & Bow Covers; Extended Swim Platform; Depth Finder and Transom Trailer Switch. NO TRAILER!! 2000 Sea Ray 210 Sundeck The 210 Sundeck from Sea Ray was built for all-day fun while providing a safe environment for passengers of all ages. With a deep-V hull design and high gunwales, the 210 Sundeck maintains a smooth, steady ride even in heavy wake traffic. With integral swim platforms, ladders, and grab handles fore and aft, access to and from the water is fast and easy - a must when children are in the water. The bow platform features a concealed ladder compartment for easy beach access. Forward and aft walk-throughs make it easy to board from the dock while midship fender locks ensure secure, simple fender tie-offs. A spacious standard seating plan allows lots of room for family and friends with two swivel bucket helm seats and aft bench seating with a removable jump seat. An optional arrangement contains a swivel bucket helm seat and an L-shaped lounger to port. Both plans feature additional passenger space in the molded bow rider seating. Entertaining is a breeze with a convenient cockpit table, Clarion AM-FM digital cassette stereo with four speakers, and cockpit remote control, insulated ice chest, carry-on cooler, cockpit lighting, and beverage holders. 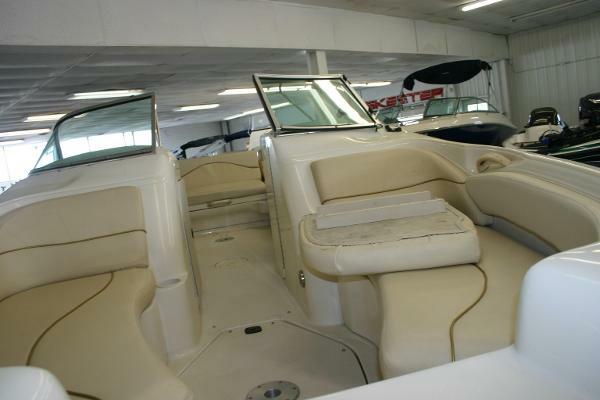 Since the 210 Sundeck is built to handle a variety of pastimes, Sea Ray has made plenty of storage space available in the cockpit side panels, under the starboard dash, and in a ski and kneeboard storage compartment in the floor, featuring vinyl matting to prevent mold and mildew. Everything remains securely stowed out of sight, so there's nothing to trip over. The 210 Sundeck even has a tinted curved glass windshield and a vinyl-baked Bimini top to provide shade. Everything's there for a full day in the sun, including a cocktail table, snap-in carpet liner, pressure water shower, sink with sprayer, and a large enclosed, lockable head area. Other standard features on the 210 Sundeck include an automatic bilge pump, electric bilge blower, tilt steering on the chrome sport steering wheel, power tilt and trim, power steering, custom Sea Ray backlit instrumentation, engine alarms, and a pearl gelcoat hull with a choice of red, blue, green, or black and gold graphics. Nice Sundeck with upgraded 260hp Mercruiser V8. 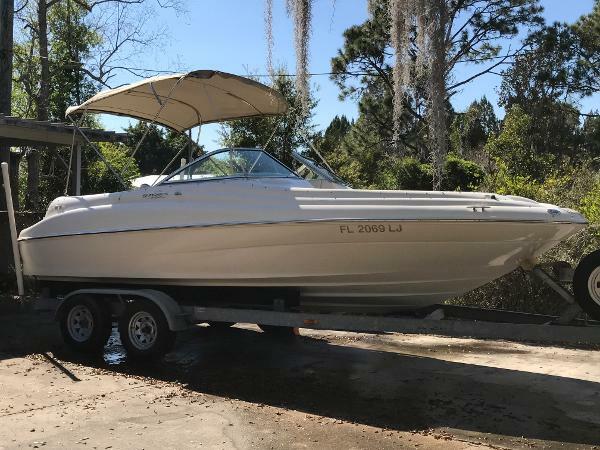 Includes bimini top, bow/cockpit covers, bimini,trailer, and more.